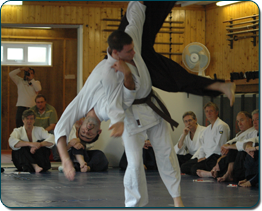 Aikido techniques are normally performed by blending with the motion of the attacker, rather than directly opposing the attack. The aikidoka redirects the attacker’s momentum, using minimum effort, with various types of throws or joint manipulation. The aim is to defend yourself without causing injury to yourself or your opponent. All movements are practised with a partner (known as an “uke”). It is this approach which appeals to many people who may be tired or put off with the usual approach of performing movements alone or in a set format such as a “Kata”. Working with a partner allows you to apply the technique you have just been shown, and to feel for yourself how the technique works. 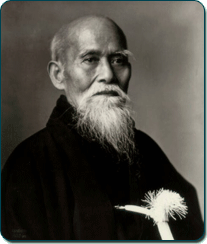 Who is Aikido for? Anyone can practice Aikido, whatever size, shape or weight – the emphasis is on your ability to blend and control your opponent using timing and technique, not strength and fitness. Clothing. For your first time on the mat wear comfortable, loose clothing with long sleeves, and full length trousers (tracksuit trousers are ideal). No special footwear is necessary; training is always barefoot. Fitness. You can train in Aikido regardless of fitness level, but a certain degree of fitness will be beneficial. The idea of aikido is to work in harmony with your partner(s) and use their own speed and momentum against them. Often being very strong can be a disadvantage as it is easy to rely on strength rather than good technique. Consult our »Aikido FAQ for more information. At the Phoenix, we operate a coloured belt system, first introduced at the beginning of the 20th century by Judo schools in Japan. The different belt colours are used to denote skill level, and enable students of mixed abilities to train together will less risk of injury. Many martial arts clubs use white belt as the lowest rank, but at the Phoenix we use an extra red belt to identify a student as a complete beginner. This enables higher ranked students to take greater care of those with little or no experience. Expert students who have reached a high level of skill are known as Dan Grades, and wear a black belt. Lower ranked students are known as Kyu Grades, and wear coloured belts (see the »table below for details). Students progress through the rankings, and thus gain their next belt by taking a test, known as a grading, where they get to demonstrate their knowledge of Aikido in front of a panel of the highest ranked members of the club. This may sound daunting, but the gradings are a great social occasion at the club, and a chance to celebrate the achievements and hard work of the students and instructors. 1st Dan Black Minimum 12 months and 120 hours. 1st Kyu Brown Minimum 8 months and 80 hours. 2nd Kyu Blue Minimum 8 months and 80 hours. 3rd Kyu Green Minimum 8 months and 80 hours. 4th Kyu Orange Minimum 4 months and 40 hours. 5th Kyu Yellow Minimum 4 months and 40 hours. 6th Kyu White Minimum 4 months and 40 hours. You can train in Aikido regardless of fitness level, but a certain degree of fitness will be beneficial; you will be able to learn the techniques more easily if you can train without getting too tired or out of breath. Will it make me fitter? Aikido is less energetic than many martial arts, but regular training will improve your strength, flexibility and stamina. 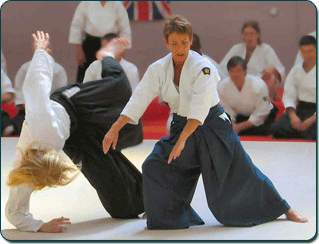 Aikido is a martial art, and like all the fighting arts, there is a risk of injury. 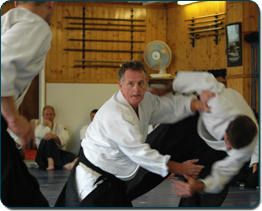 However, the injury rate in Aikido is low compared to other disciplines, and the philosophy and style of practice at the Phoenix reduces this risk even further. We take great pride in the care shown to new students, and want everyone to enjoy their training with the minimum of risk. Do I need any experience of other martial arts? No experience is necessary; indeed, some people find previous training in striking styles like Karate and Tai Kwon Do can be a hindrance, as it can sometimes make it difficult to achieve the relaxed, flowing movements necessary in Aikido. For your first time on the mat wear comfortable, loose clothing with long sleeves, and full length trousers (tracksuit trousers are ideal). If you decide that Aikido is something you want to practice regularly, then you will need to invest in a Gi», which is the traditional white cotton suit worn in most martial arts. No special footwear is necessary; training is always barefoot. Do the Instructors have any coaching qualifications? All Instructors have either Coach Level 1, 2 or 3. This qualification is available through the BAB». Instructors taking the juniors classes also hold the specialist coaching BAB award ‘Young Person’ as well as a CRB» check. Most Instructors have also attended a First Aid course. All students are insured immediately and the Instructors have additional Professional Indemnity Insurance.